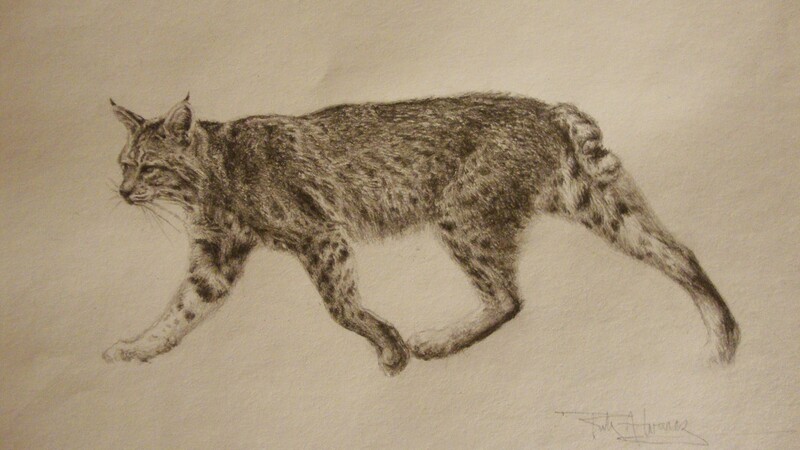 This is a study in graphite of a gorgeous creature that lives here in the Sierra Nevada Foothills. The Bobcat, Lynx rufus never ceases to amaze me when it pops out of a bush or strolls across my front yard. I love so many of it’s physical attributes like it’s tufted ears and bob tail as well as it’s hunting adaptability and just plain coolness. While looking at the Bobcat I realized how intelligently designed it’s fur is, from the speckled pattern that breaks up it’s outline, to longer hairs under it’s belly, and behind it’s legs to wick away moisture. I also noticed thicker hairs on different parts of the body for temperature control. The entire shoulder, arm and paw including the hind haunches are built for the pounce and subduing it’s prey. These may seem like observations that a biologist would make but this is also how an artist sees and thinks when making art. Here is how I started my drawing. I went from a quick gesture drawing to a precise line drawing that accurately described the form before I allowed myself to even begin rendering the hair and the easily identifiable characteristics. I also check and correct the outline drawing using Unit and Angle measuring techniques until the form can no longer be corrected. “The longer you stay in this stage the more convincing your drawing will be.” This is a first and important step in all of my studies. I hope this has added a little art to your life, helped inspire you to look at and appreciate nature and love the bobcat! I plan to share more drawing tips in future posts. This drawing was made from the photography by: DeBold, Don. Calero Creek Bobcat. Digital image. https://www.flickr.com/people/28156071@N00. Don DeBold, 1 Dec. 2007. Web. 20 Dec. 2015.